In case anyone missed out on our Annual Spring Reunion party, we wanted to give you a quick recap! Every year it feels as though our reunion parties keep on getting bigger and better. It is always a treat to reconnect with our campers and alumni, and immediately feel like we’re right back at camp. Our girls camps have become such a family over the years that we always feel at home when the gang is back together. 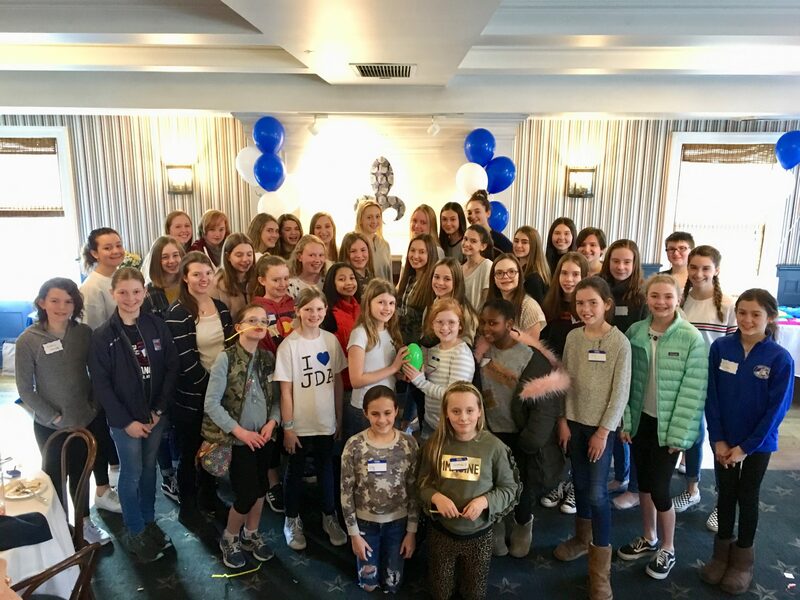 Year after year, these reunions remind us that the bonds formed at the best summer camps for girls extend well beyond just the summer season. We have created life-long bonds! We all sat around a delicious lunch buffet in Rye, NY at the Rye Grill and Bar, reminiscing over old camp memories and catching up on each other’s lives. Attendees enjoyed a mouthwatering spread of pasta, caesar salad, fries, chicken strips, avocado wraps and a fruit platter that kept us all coming back for more. Following lunch, we devoured a decadent cake trimmed with our girls camp colors, blue and white! This meal was a much-needed source of energy for the games and laughs that followed. As you can imagine, the fun began as soon as guests walked in the door. Campers got busy, each making a “pipe cleaner girl” to add to their table’s Fleur-de-lis centerpiece. We know our girls love a little competition, and were eager to go head-to-head for the “most creative centerpiece” award. We love how simple crafts like these create a sense of unity and camp nostalgia. Randy also lead a few fun camp games for the girls including trivia, charades, and silly human tricks! Winning teams were invited to pick from a giant pile of oversized Easter Eggs, each containing a mystery surprise. Some girls found candy, silly string, or a $20 bill in their egg! There’s nothing like a little organized easter egg chaos to get everyone laughing. We were thrilled this year to be able to have over 80 people in attendance including current campers, their families, and camp alumni! We were excited to even have a few campers present who will be attending camp this upcoming summer for the first time. They got a little taste of our fun camp shenanigans–they fit right in! Our girls this year came from all over to attend. Most dedicated, went to a camper (and her mother) all the way from Montreal, Canada! Others traveled from NY, NJ, CT and MA. For many of us, this is one of the only opportunities we have to reconnect outside of camp, and it means a lot to have so many campers all in one place. Sure does amp up the anticipation for this upcoming summer! It is incredibly exciting and inspiring to have some of our most senior alumni make the trek out to these reunions. One of our loyal alumnae who attended Camp Jeanne d’Arc back in the ’50s with Colonel, our camp founder, was there to share stories with the rest of us. 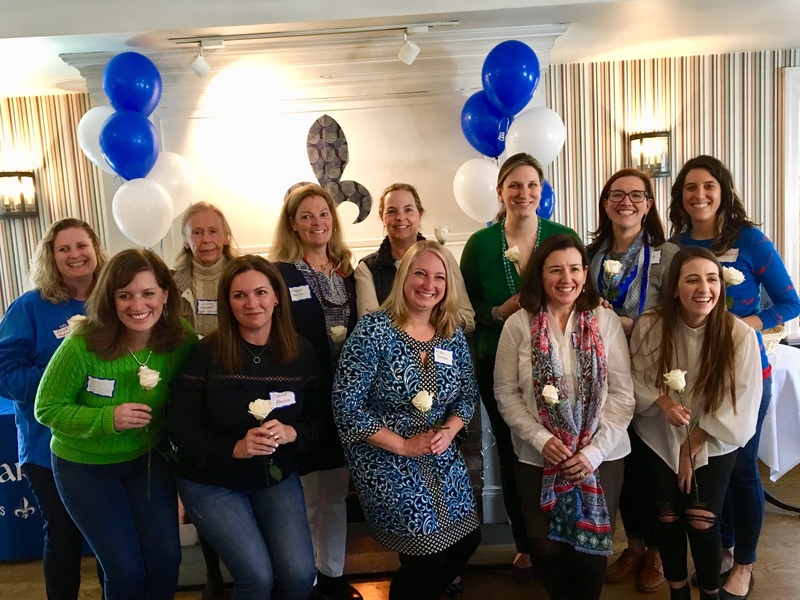 Every alumnae, young and old, at our reunion party, was recognized with a white rose from our camp director, Sandy, and was invited to stand and share which year she attended camp, and which team (Les or Jolis) she belonged to! To have such dedicated alumni is truly a testament that Camp Jeanne d’Arc is one of the best summer camps for girls around the country! As you probably know, our all girls camps are unique. Camp Jeanne d’Arc in the Adirondacks continues to be a memorable part in our campers lives well into adulthood. We pride ourselves on not only being another fun camp our girls will remember, but also an important part of their growth into strong, confident, independent women. What a special occasion it was to be able to celebrate this year! Camp JDA has several parties and open houses. Click here to find out the dates of one near you! As if this day wasn’t heart-warming enough, we finished with a group photo and a cheerful celebration upon the realization that there were only 100 days left in between us and our first camp session on June 28th! We can’t wait to see you all there!